Respecting Ramadan at Work: Whos Walking the Talk? You are here: DiversityInc | Homepage Free Stories | Respecting Ramadan a . . .
Respecting Ramadan at Work: Who's Walking the Talk? © DiversityInc 2007 ® All rights reserved. No article on this site can be reproduced by any means, print, electronic or any other, without prior written permission of the publisher. The holy month of Ramadan, which ends today, used to pass unacknowledged by most U.S. employers. But the $580-million Muslim market and increasing religious diversity in the workplace have convinced progressive companies to pay attention. In the excerpts below, Mohamed Ly, founder and executive director of MultiLingualPros.com, tells you about Ramadan in the workplace and which companies are getting it right. Subscribe now to read a provocative Religion in the Workplace roundtable in the upcoming Nov./Dec. 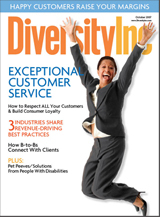 2007 issue of DiversityInc magazine. During Ramadan, American Express' Middle East and North Africa offices adjust their business hours to accommodate their Muslim employees. Work starts at 9 a.m. and ends as early as 2 p.m. to allow Muslim employees to go home to engage in prayer and Iftar (breaking the fast). For safety reasons, shorter working hours make sense in the construction and other heavy-duty industries during Ramadan. Reduced work hours are not the end-goal though, as Muslims also consider work as a way to express their worship. American Express is No. 23 in the Top 50. The development of information resources (with corporate-education programs, intranet, company newsletter, bulletin boards, interfaith resource networks) for employees is a very effective and growing practice that helps improve knowledge and awareness. According to Islamicity.com, more and more employers allow Muslim employees to slip out at sunset in order to break their fast. A growing number of company cafeterias even adjust their hours to cater for employees' Iftar needs. Sodexho, No. 12 in the Top 50, is known to—single-handedly or in partnership with its clients—host Iftar meals during Ramadan. While global in size, they've also managed to be strategically localized and in synch with local values, sensibilities and realities. In Europe, employers continued to struggle with "headscarf" cases in court until recent years, most of which focused on the question of whether or not female Muslim employees are allowed to wear a headscarf (hijab) in the workplace. In the United States, many female Muslims may opt to wear a hijab during the Muslim holy month of Ramadan. Employers accommodate these employees by allowing them to wear one without (formally or informally) being in violation of the company dress policy, as they are only honoring their beliefs. This sends a positive message to other Muslims, prospective employees and customers alike. Nestlé, ahead of the curve, rolled up executives' sleeves more than a decade ago to meet a significant and fast-growing halal demand. Tesco and McDonald's have also joined in—Tesco is adjusting hours and store activities to allow staff time to pray in specially allocated areas at work, and McDonald's serves halal Chicken McNuggets for customers. Ikea takes it further with serious plans to sell decorative items for Ramadan and to provide female Muslim employees an Ikea-branded hijab to cover their head if they wish. The motivation is huge, with more than 1.6 billion Muslim consumers worldwide and a growing $580-billion market, according to Malaysia's Halal Industry Development Corporation. No organization, be it humanitarian, academic, commercial or governmental, can afford to ignore the reality of the irreversibly global and fiercely competitive environment in which we live and work. In the war for talent, the same tactics that serve educational institutions to lure more students can be adapted and used to attract and retain top-performing employees and socially responsible and law-abiding citizens. Employers can achieve this through intelligent implementation of policies aimed at making companies an ideal place to work for people of all faiths. Have a news tip for us? If you are a diversity newshound with a good idea for a story, click here to send your story. We'll pay $10 for every idea we use. DiversityInc gives you the first national Noose Watch to show you recent noose incidents and increase public awareness of this dangerous racist trend. © DiversityInc 2007 ® All rights reserved. Thank you for visiting DiversityInc.com! View subscriber benefits or purchase a premium subscription now!